Gilder Lehrman Collection #: GLC02429.39 Author/Creator: Hemans, Daniel W. (fl. 1872-1881) Place Written: Nebraska Type: Autograph letter signed Date: 19 June 1875 Pagination: 2 p. ; 24.8 x 19.5 cm. Summary of Content: Discusses his wife Nancy's illness with rheumatism, a book he received, and the threat to his garden posed by grasshoppers. "Nancy is very sick with rheumatism, she is in sick bed now for over three weeks & helpless." 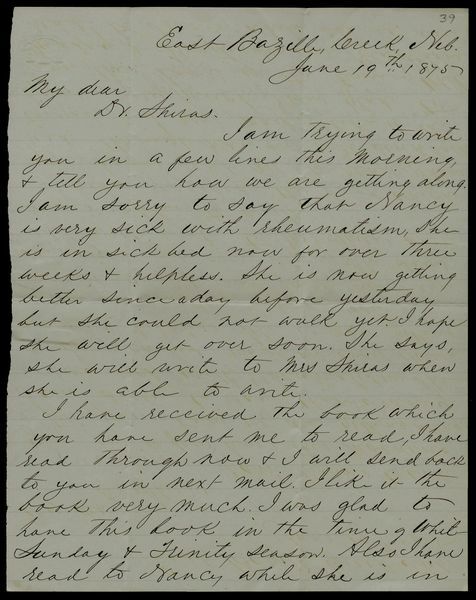 "I have received he book which you have sent me to read, ...I have read through nowâ€¦I like it the book very much. I was glad to have this book in the time of White Sunday & Trinity season. Also I have read to Nancy while she is in sick bed." "Mrs Hinmanâ€¦was very sick with rheumatism & some other diseasesâ€¦"
"I have a nice garden & planted tow acres with corn & potatoes, but we have grasshoppers like very heavy clouds in the air in the two days passing towards south & we are afraid they would eat up every thing again."